I want to explore two major economic elements within the U.S. prison system below. Firstly, slave labour within prisons and the connection to corporations, whose products are used by most Americans. Secondly, the privatization of prisons, detention centers and other services, which used to be managed by more accountable bodies. Both of these elements are closely tied to American treatment of minority groups, especially African Americans, and people in economic poverty. Both of these elements have also seen recent social action, by the government and the prisoners themselves. The most revealing part of this proclamation is the exemption of slavery as a punishment for crime. This has meant that slavery has continued in the U.S. for 150 years! In the years after slavery, a formal prison system formed in the South. Some plantations were bought by the state and turned into prisons. In the short illustrated video below, the Equal Justice Initiative narrates the details around the fact that mass incarceration is a direct descendant from slavery. that control being used to exploit people economically. By their very nature, prisons control people. They control every aspect of prison life including where and when prisoners can move. They control access to basic services like health care and educational materials. They control what food prisoners receive. As these parts are given, they can also be taken away – a form of psychological control. Human Rights Watch (HRW) has reported on staff brutality and degrading treatment of inmates the occurs across the country’s prisons. U.S. prison inmates have been beaten with fists and batons, stomped on, kicked, shot, stunned with electronic devices, doused with chemical sprays, choked, and slammed face first onto concrete floors by the officers whose job it is to guard them. Jail and prison staff throughout the United States have used unnecessary, excessive, and even malicious force against prisoners with mental disabilities, “even when, because of their illness, they cannot understand or comply with staff orders.” Inmates have ended up with broken jaws, smashed ribs, perforated eardrums, missing teeth, burn scars—not to mention psychological scars and emotional pain. Some have died. In many states, death penalties continue the history of race-based lynching. Once violent control is established, slavery occurs through economic exploitation. This exploitation is accompanied by paying the individual nothing, or close enough to that. This is exactly what the 13th amendment has allowed the U.S. to do to prisoners for the past century and a half. According to Alternet, prior to the 1970s, private corporations were prohibited from using prison labor as a result of the chain gang and convict leasing scandals. But in 1979, the US Department of Justice admits that congress began a process of deregulation to “restore private sector involvement in prison industries to its former status, provided certain conditions of the labor market were met.” Over the last 30 years, at least 37 states have enacted laws permitting the use of convict labor by private enterprise, with an average pay of $0.93 to $4.73 per day. 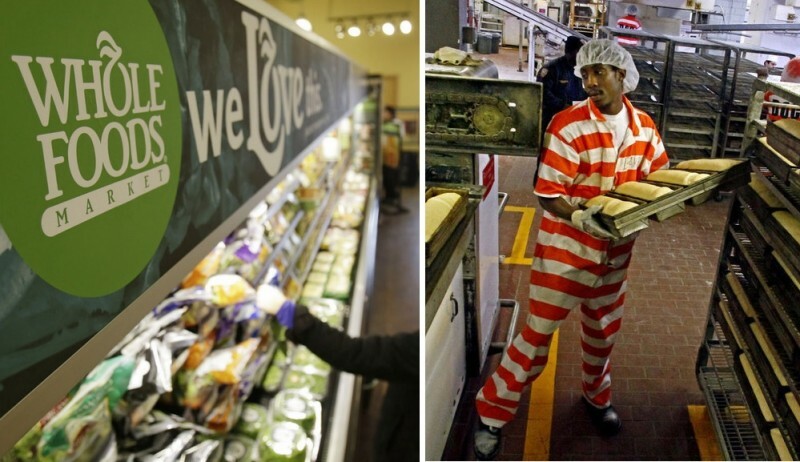 Whole Foods has sold goods such as fish and cheese produced by Colorado prisoners. McDonald’s has purchased uniforms and plastic utensils made by Oregon inmates. Female inmates in South Carolina sew undergarments and casual-wear for Victoria’s Secret, while AT&T has consistently used inmates to work in their call centers since 1993. From agriculture to technology, the list of businesses – Wal-Mart, BP, Aramark included – that use prison labour in their pursuit of profit is lengthy. American capitalism is inextricably tied to American prison labour. This is, simply, corporate slavery. The United States government also benefits from the cheap cost of forced prison labour. On average, federal prisoners work 8 hours a day, but they have no union representation and make between $0.23 and $1.15 per hour, over 6 times less than federal minimum wage. Federal prisoners are employed by Unicor, a wholly owned government corporation established by Congress in 1934. Its principal customer is the Department of Defense. Two weeks ago, on the 45th anniversary of the Attica Rebellion, prisoners across the United States decided to do something about this unjust system of slave labour. Just as others have done in the past to gain greater control of their own labour, prisoners protested and stopped all work on September 9th. 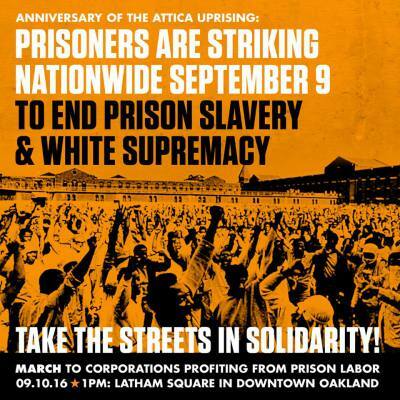 This day of action was organised by the Incarcerated Workers Organizing Committee (IWOC), the prison-organizing group of the Industrial Workers of the World labor union, which has been using work stoppages as a means to attack the economic incentive of prisons. On September 9th, more than 24,000 prisoners missed work, which affected at least 29 prisons. This was the largest prisoner protest in U.S. history. Solidarity protests in cities across America also occurred following this day of action. I’m hopeful that these types of protests will bring greater awareness to the issue of slave labour within the American prison system and the corporations who profit from this involuntary labour. In the meantime, citizens and consumers also have the power to act by supporting prison reform as well as boycotting products made from prison labour. While prison labour for rehabilitation may be beneficial for re-entry to society if a decent wage was paid, some prisons exist to lock up people for as long as possible and solely for profit. I’m speaking about private, for-profit prisons. The U.S. locks up more people than any other country on Earth. The country has about 5 percent of the world’s population but more than 20 percent of it’s prison population. To deal with that overcrowding, the US turned to private prisons. Those private companies make big money. Private companies make millions through the construction of new prisons, government contracts for prison management, and providing transportation and probation services to correctional departments. These components of the for-profit American criminal justice system are discussed below. The two largest for profit prison companies, Corrections Corporation of America (CCA) and Geo Group, played significant roles in crafting criminal justice legislation in the United States, leading to increased mandatory minimums and incarceration rates. Indeed, stipulations are often written into the contracts of prison management companies to require 90 percent occupancy of the facilities. Concurrently, companies cut costs by reducing quality of life and basic care for inmates, leading to overcrowding and inhumane conditions. This sector of the economy is difficult to investigate. However, in a special investigation of the private prison industry, Shane Bauer, a reporter for Mother Jones, spent four months working as a prison guard at Winn Correctional Center in Winnfield, Louisiana, one of the nation’s oldest private prisons. CCA, the company that runs this prison, takes in $1.9 billion a year and its stock is traded on Wall Street. One way private prisons can make large profits is through low-wage staffing. At state run prisons, guards were making $12.50 an hour. At private prison, they were making $9 an hour. For this wage, guards like Shane witness stabbings, beatings and prisoners threatening to riot inside the prison on lockdown. At his morning meetings, Shane recalls that “sometimes there would be 24 guards there for 1500 inmates. There often were not enough staff to keep the prison running the way it was supposed to.” This despite the company’s contract with Louisiana which states that they’re supposed to have 36 guards show up for work at 6:00 AM every day. While Winn is deficient in manpower, CCA’s CEO is making $3.4 million a year, nearly 19 times what the head of the Federal Bureau of Prisons makes. This is the corporatization, the “Wal-Martification”, of the U.S. prison system. In fact, CCA competes with Wal-Mart for employees in the area. Since almost everything that happens at the prison requires guards, fewer guards means fewer programs for prisoners. To further maximize profits, services at privately-run prisons are kept to a minimum. The physical conditions are barely tolerable. Medical and mental health care are inadequate. Shane met a prisoner who contracted gangrene at Winn and lost his legs and fingers as a result. Shane also found that prisoners were getting an insufficient amount of calories in their meals. Rehabilitation courses, like welding classes, and recreation are absent. Instead, most inmates sit in the dorm all day long. Getting bored, frustrated, and angry. Prisoners and guards both reported to Shane that Winn was more violent than other prisons they’d been to. For one inmate, “forced fighting and stabbings, it doesn’t surprise me no more, after you’ve seen it so long.” In the first 4 months of 2015, CCA reported 200 weapons found at Winn. That’s 23 times more than were found at Angola, which is a maximum security prison. In his first two months, Shane heard about 12 stabbing that had occurred. However, when he looked at data from the Department of Corrections, it showed that CCA had only reported 5 stabbings in a 10 month period. They weren’t reporting all the stabbings. Little was being done to prevent violence inside the prison. These conditions are not isolated to Louisiana, either. The documentary Prisons for Profit, made by ACLU Ohio, examines the condition of the Lake Erie Correctional Institute, operated by CCA, in Ohio. In this “institute” violence increases, especially as CCA takes a “no touch” approach, whereby guards are not allowed to intervene when fighting breaks out. Shane was instructed that the protocol in Winn is to verbally tell them to stop and that’s it. Back out, lock the room, and as he told, “Let them cut each other up.” If fighting intensifies to a certain level, chemical weapons are released to maintain order: pepper spray for fighting or stabbings; tear gas if a riot breaks out. One of the classic means for preventing violence is to occupy prisoners time with rehabilitation services, such as schooling. Unfortunately, private prisons cut these programs from their budgets to ensure profits are maintained. On the same day as the DOJ announcement, CCA and GEO Group, the two largest private prison companies in the country, lost almost half of their share value, equivalent to $2.2 billion. Shareholders and former inmates are filing lawsuits against CCA and GEO Group. The prison Bauer worked at, Winn Correctional Center, is no longer run by CCA; unfortunately, the new company is facing budget cuts, which means fewer medical and rehabilitative programs will be offered. The Department of Homeland Security said it would reevaluate its use of private prisons. A DHS council will consider whether federal immigration detention facilities should follow the Justice Department’s lead and phase out privatized operations. The corrections system in the US has also subcontracted services to companies that would normally fall under the scope of local police and sheriffs. The Marshall Project has investigated the case of private prison extradition industry in many states. Each year, tens of thousands of fugitives and suspects – many who have never been convicted of a crime – are entrusted to a handful of small private companies that specialize in transferring the men and women across the country. The Marshall Project uncovered cases of two prisoners dying of perforated ulcers, another woman who was sexually assaulted and a third who had to have both legs amputated from complications of untreated diabetes. These types of services are bad for everyone involved. Prisoners face abuse and mistreatment. At least 14 women have alleged in criminal or civil court since 2000 that they were sexually assaulted by guards while being transported by these companies. The workers are made to work long hours, to drive unsafe, as companies try to minimize wages paid. The companies are usually paid per prisoner per mile, giving them incentive to pack the vans and take as few breaks as possible. Crashes have killed a dozen prisoners and guards. The public is at risk of both of these factors. At least 60 prisoners have escaped from private extradition vehicles since 2000, including one who later stabbed a police officer and another who was accused of sexual assault on a minor and is still missing. 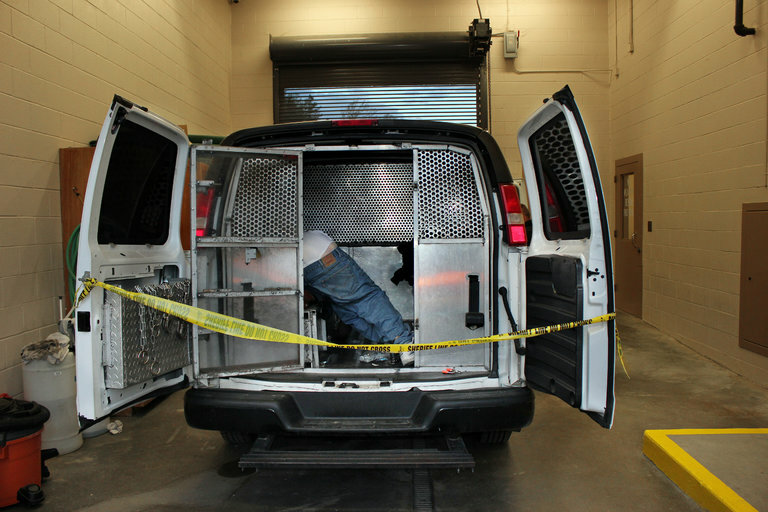 Prisoner escapes are difficult to investigate as vans constantly cross jurisdiction borders. It’s difficult to reason that this system is benefiting anyone other that the companies who are profiting and largely unaccountable. In certain states, private probation companies perform all of the work of an exhausted legal system – from levying fines to collecting payments for misdemeanors – without any need for a judicial authority. This has created modern-day “debtor prisons”. Laws are written that almost exclusively affect people living in poverty. In one extreme example, a woman in Arkansas wrote a check for $1.07 for a loaf of bread. The check bounced and her debt ballooned after fees and fines to nearly $400. Every year, US courts sentence several hundred thousand people to probation and place them under the supervision of for-profit companies for months or years at a time. In their report, “Profiting from Probation: America’s ‘Offender-Funded’ Probation Industry”, Human Rights Watch reports how minor traffic violations, like speeding, or misdemeanor crimes, like public drunkenness, put people in jail if they fail to make adequate payments towards fines and probation company fees. In Georgia, Thomas Barrett pled guilty to stealing a can of beer from a convenience store and was fined $200. He was ultimately jailed for failing to pay over a thousand dollars in fees to his probation company, even though his entire income—money he earned by selling his own blood plasma—was less than what he was being charged in monthly probation fees. These examples of privatized criminal (in)justice in the U.S. – prisons, immigration detention, prisoner transport and probation – are just the tip of the iceberg of the current problems that exist within the prison-industrial complex. Until prisoners are treated with respect and given the most basic of human rights, the American justice system will never become just and will never solve the problems of crime that exist in and outside of prison wall.